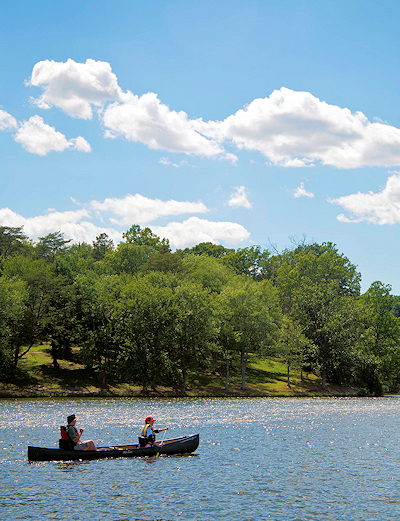 Changes could come to Lake Fairfax Park as the Fairfax County Park Authority, jumpstarts the planning process to update the master plan for 482-acre park. The authority will hold a public information meeting on Nov. 1 at 7 p.m. at South Lakes High School (11400 South Lake Drive) to discuss possible revisions to the park’s master plan. The process establishes the longterm vision for how the park will be used in the future and current unmet needs. Updates come as demand for more recreation and park options grows, according to county officials. The current plan, which was launched in 2001, is outdated as additional parcels and structures have also been added to the park since its creation. Roughly five acres along Hunter Mill Road were also added to the park within the last decade. “The plan will focus on the features of the added property, potential new facilities, and reevaluating existing facilities to see if they are still meeting the community needs and preferences,” said Judy Pedersen, the authority’s spokeswoman. The meeting in November will introduce the project to the community and include time for community input as the authority assembles a draft concept plan. At a second meeting, staff will present the draft plan to the community and hear feedback, after which the Park Authority Board will make a decision about the final master plan. The plan will also recommendations for land uses of recently acquired parcels and potential new facilities, Pedersen said. “Ultimately, the purpose of the master plan revision is to determine how to best incorporate the newly acquired acreage and determined needs within the existing framework of the park,” she said. While the master plans lays out a refined vision for the park, it requires capital funding for complete implementation. The park, which was originally a dairy farm in the early 1900s, currently includes a 20-acre lake with fishing, boat rentals, a carousel, athletic fields, picnic shelters, a skate park and campgrounds. The authority acquired a 292-acre parcel in 1966 and a 129-acre parcel in 1972. As of mid-October, the authority owns or cares for more than 23,000 acres or roughly nine percent of all open space in the county. The authority is accepting public comments and questions through Dec. 1 via email at [email protected]. For more information on the planning process and for project updates, visit the county’s website.